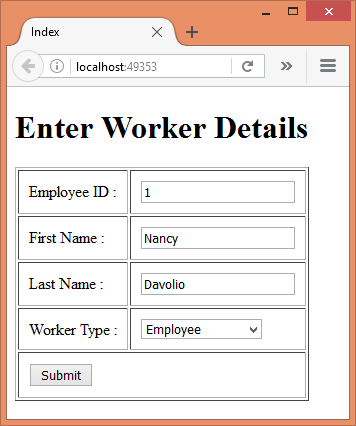 ASP.NET MVC offers model binding to capture form field values entered in a view. In many cases model binding to complex types serves the purpose. When the model type to fill from the values is known at development time, you can specify a parameter of that type. However, this is not always the case. That is where programmatic model binding comes handy. Programmatic model binding allows you to perform model binding at runtime based on some condition or processing logic. The page captures details about workers doing certain job. The EmployeeID, FirstName and LastName fields are quite straightforward. The tricky thing is - depending on the selection in the Worker Type dropdown list you need to bind the values with two different types. When the Worker Type is Employee you want to bind the values to Employee object and when the Worker Type is Contract you want to bind values with ContractWorker object. In this case the target type is dependent on the selection in the dropdown list. Obviously, you can't decide at development time as to which type is to be model bound. Let's see how programmatic model bind can be used in such a situation. In this example, both the classes area almost identical but that's not necessary. In addition to the properties to be model bound they can contain a different set of properties as per your requirement. Now add a new controller (HomeController) and Index view. Then key-in the following markup in the Index view. The Index view consists of a <form> that submits to Process action as indicated in the action attribute. Although the above markup uses plain HTML tags, you could have also used HTML helpers. The Process() action takes a string parameter - workerType. Note that workerType is name of the dropdownlist on the Index view. This way you get the selection of Worker Type in the action. Then two if blocks check the workerType value. If it is E a new object of Employee is created. This object will be initially empty. To fill various properties of emp object you need to perform model binding. To accomplish this task UpdateModel() method of the Controller base class is called. The UpdateModel() method accepts an object and tries to model bind it with from the Request.QueryString or Request.Form collections. Similarly, the other if block fills the ContractWorker object. Once filled, you can use emp and worker objects as per your application's need. Your code throws this exception because UpdateModel() can't convert string to integer. You can add try-catch to your code to deal with this kind of exception but there is an alternative - TryUpdateModel() method. The TryUpdateModel() method is quite similar to UpdateModel() but it silently returns true or false instead of throwing an exception. That means TryUpdateModel() will return true if everything goes well, otherwise it will return false. So, your job is to simply check this return value instead of adding try-catch. The following code shows how this can be done. As you can see, the return value of TryUpdateModel() is stored in flag variable. If this flag is true only then application specific processing is invoked. 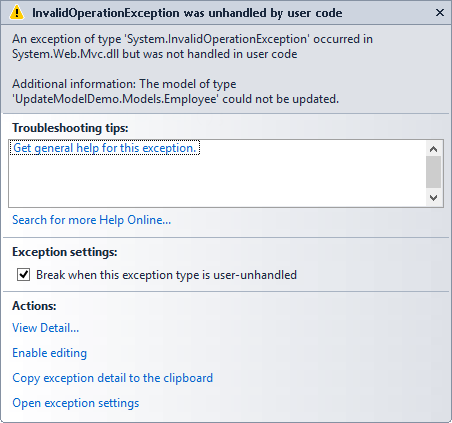 If you try to run the application again and enter some string value in EmplyeeID textbox, this time you won't get any exception. The flag will be silently set to false.